Sidney has found a loving new home! 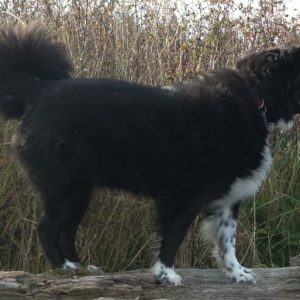 We were on the lookout for the very best home for Sidney where she would be able to receive all the love, care and attention her owner wanted for her. We are very pleased to have found a retired couple on Fox Island who opened their hearts and home to this very sweet and deserving dog. I am a retired Registered Nurse and my husband is a retired Airline Pilot. 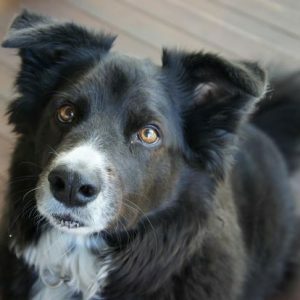 We’ve had rescue dogs all of our married life and our 17 yr old Australian Shepherd recently died. We have a rescue cat named “Mouse” who we think is 11yrs old. He gets along with dogs -mostly ignoring them. He spends most of his time in the house. We are very active seniors and looking forward to having another dog. 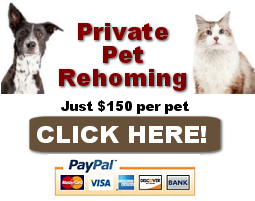 Contact our pet rehoming team or request Seattle dog rehoming services now. Below is how our Seattle pet rehoming team presented Sidney to attract her new family! Hi, My name is Sidney – Sid! Sidney is the cutest, smartest, most devoted dog you will ever meet. 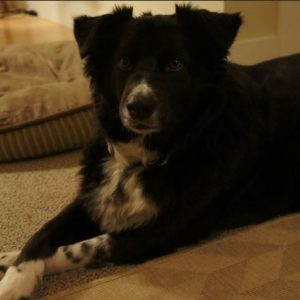 She is a lovely mix of Border Collie and Australian Shepherd. Just 7 years old and in excellent health, Sidney has been spayed, micro-chipped and fully vaccinated. She is house trained and very well behaved. Sidney’s owner loves her so much. 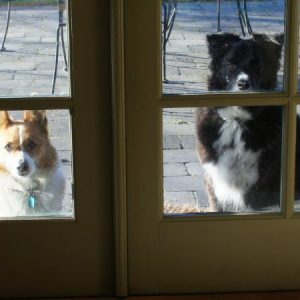 Unfortunately, a divorce has taken away Sidney’s fenced back yard, and her owner is working long hours as a single Mom. The family’s busy schedule leaves very little time to spend with Sidney, and she has no yard to play in. They want what is best for her, and are dearly hoping to find a nice family or couple who will cherish her and keep her safe, happy and healthy. 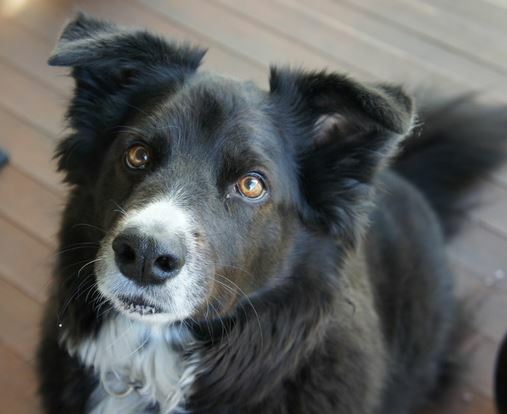 Sidney is great with other dogs and cats – and loves children. She loves to spend time with people, and would love a home with folks who have lots of time to spend with her. She will be rehomed with supplies, and the owner will provide veterinary records and information. The family would love to keep in touch with Syd – and even visit once in a while – but only if the new owners are comfortable with it. Please offer Sweet Sidney the loving home she needs and very much deserves, today! Please call or email for more information on adopting this beautiful dog. Age of Pet: 7 yesar 4 months Spayed/Neutered? : Yes Health Problems: No Up To Date on Vaccinations: Yes Gets along with cats: Yes Gets along with dogs: Yes Good with Children? : Yes House Broken or Litter Trained? : Yes Crate Trained? 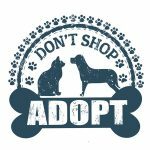 : No Accessories Included: 2 cozy dog beds, water and food dishes, basket of toys, grooming brush, food and joint supplement, monthly flea treatment, and doggie treats! Moved from a large home with 3 kids and a yard, another dog and 3 cats to our current town home. Currently Sid lives with me and 2 older teenagers. While our indoor space is ample, we do not have any outdoor space, so Sid’s outdoor time is a walk at the end of the day. I am a single mom with 3 kids. One is grown and on her own now, and my 18 year old will be leaving for college this summer. My youngest is 16, and we rescued Sid for her. I have gone back to work this past year and the kids are gone much of the time now busy with sports, friends and jobs. Sidney – Sid’s Favorite Toys, Foods, Activities? Sid loves bones from the butcher shop most of all – this keeps her very busy on the front porch for some time! Enjoys going to the park where she can run, play and herd other dogs. She also loves playing with our cat – a bit of playful boxing which our cat, Finn, completely is in charge of! Sid has been on grain-free food most of her life, and recently I have added a joint supplement which she has responded well to. Evenings that Sid is tired and ready to go to bed before the rest of us, she will quietly peek around the corner at us and will hide as soon as she sees us noticing her. She will wait a moment and then peek again – -so funny and adorable. Once we tell her she can go to bed, off she goes upstairs to her cozy place. Why is Sidney – Sid Being Rehomed? We have down-sized our living space in the past couple of years, our children are grown, busy and gone much of the time, I have returned to full-time work that has recently asked me to do some traveling. 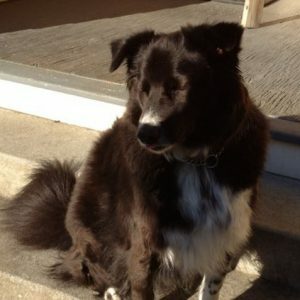 Primarily, we feel that Sid needs outdoor space and to be surrounded with more attention and companionship. We feel sad leaving her alone so much of the time. 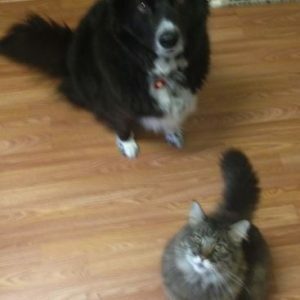 A family that has older children and spends most time at home or doing activities that would include Sid. 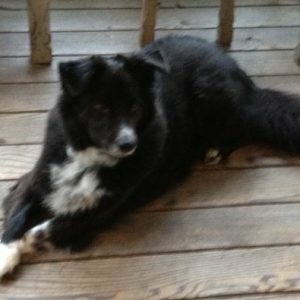 Ideally, a home with a fenced yard or farm/ranch where Sid could spend a lot of time exploring and relaxing outside. 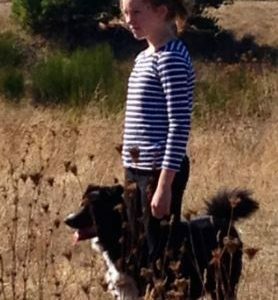 Probably not a family with small or inexperienced children with dogs, as Sid’s front feet are sensitive and she seems to worry about them getting stepped on.